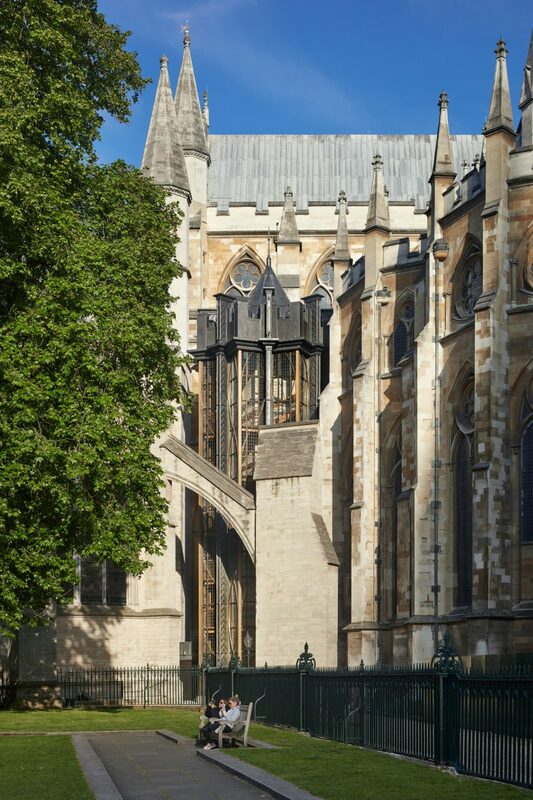 Ptolemy Dean Architects has added a star-shaped tower to London’s Westminster Abbey, the most significant addition to the building since 1745. Standing at seven stories tall, the £23 million Weston Tower is a modern take on gothic, which has been been described as “sci-fi gothic” by Guardian critic Olly Wainwright, and “steampunk gothic” by broadcaster and critic Tom Dyckhoff. 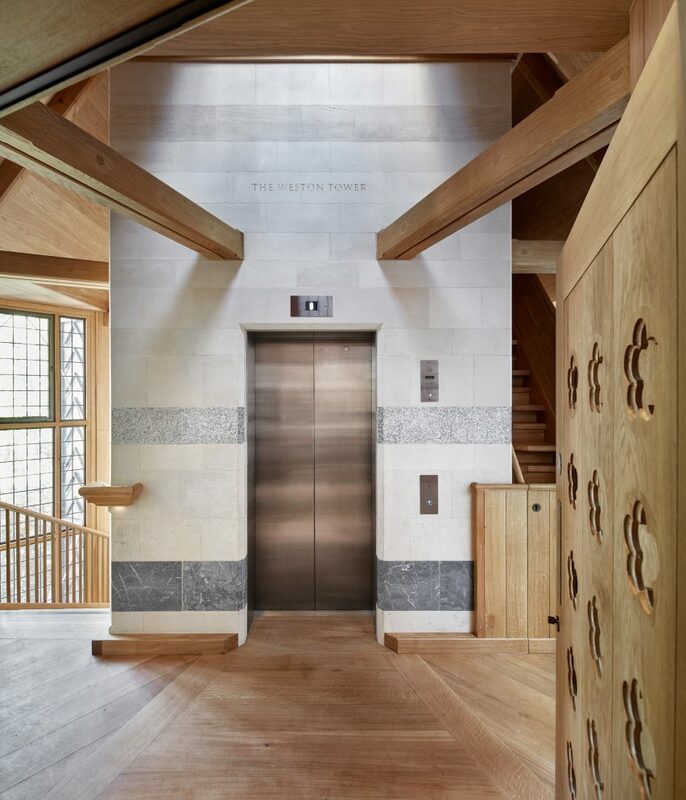 Designed by Ptolemy Dean Architects, the tower has been built to provide access to the Queen’s Diamond Jubilee Galleries, which open to the public on 11 June, 2018. Designed by London-based practice MUMA the exhibition space is situated in the abbey’s previously rarely-visited triforium – a space that runs around the upper perimeter of the interior and could previously only be reached via a steep, cramped staircase. “It [the triforium] provides breath-taking views across the abbey, enabling its architecture to be seen without the obstruction of monuments and furnishings and thereby readily understood,” explained practice founder Ptolemy Dean. 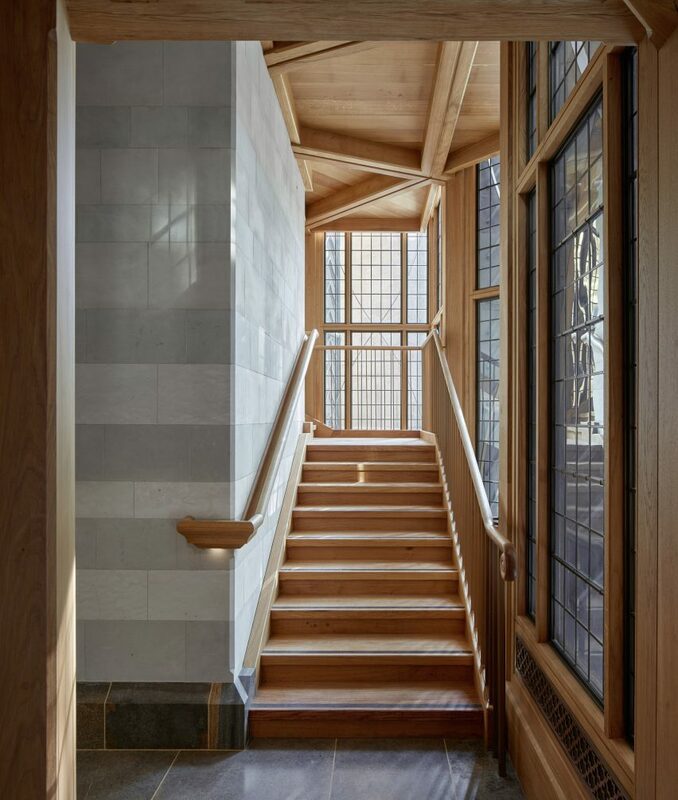 The stair is situated on a small patch of land referred to as the Poet’s Yard, which lies between the existing 16th-century Lady Chapel and the 13th-century Chapter House. 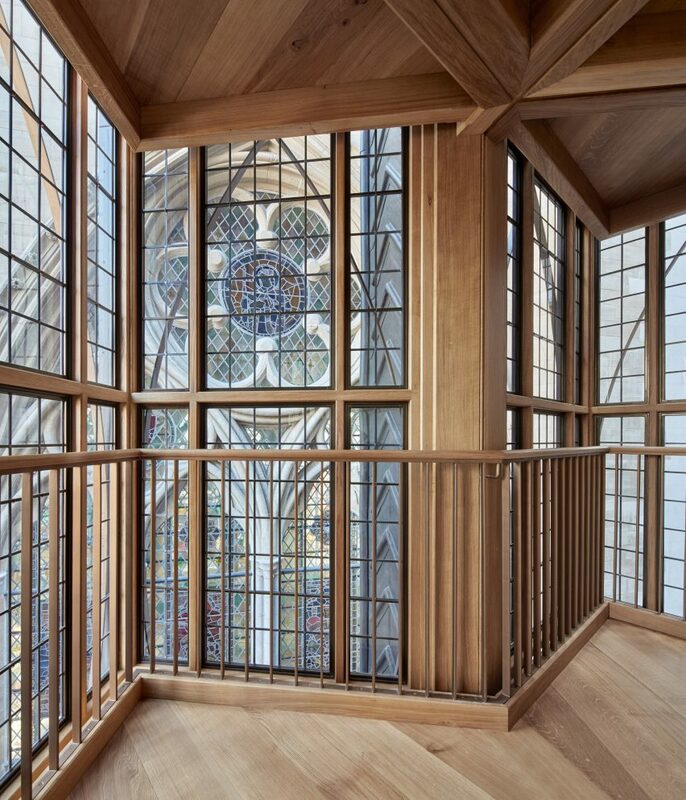 As building an internal stair would have damaged the building’s historic fabric the Westminster Abbey decided to create an external access route to tree new exhibition spaces. The steel-frame tower is composed of two stacked square volumes, one of which has been rotated at a 45-degree angle to create a star-shaped floor plate. This is intended as a visual nod towards the star motifs seen on the decorative altar screens of St Faith’s Chapel and on the stained glass windows of the the abbey. At the peak of the new addition sits a steel crown. This has been designed in reference to the crossing tower of Cambridgeshire’s 11th-century Ely Cathedral, which is topped by a faceted light-emitting structure called a lantern. “The Ely lantern is a timber-framed structure that is clad in lead and whose piers also conceal rainwater pipes. The new tower at Westminster follows this same tradition, albiet using steel instead,” said Dean. At the centre of the tower is a lift, designed to accommodate disabled visitors and carers. 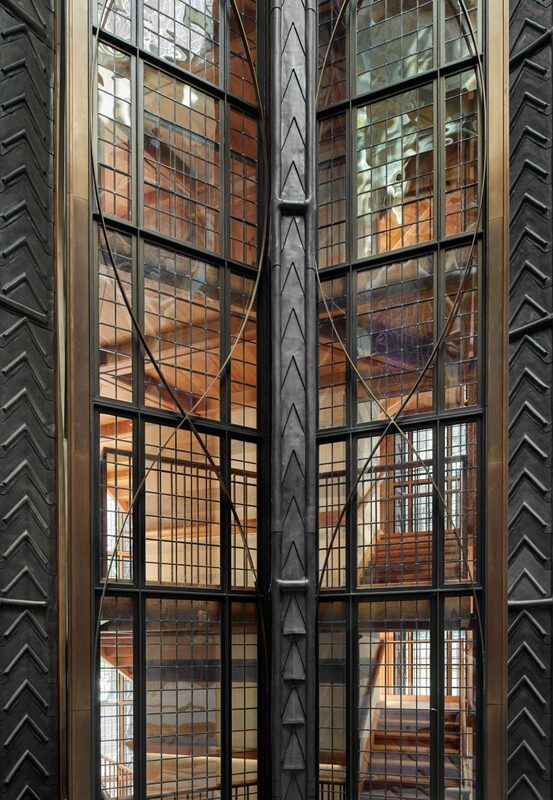 Around it wraps a dog-leg oak staircase, which is illuminated by patterned panels of glazing that have been inserted between the towers’s steel columns. The exhibition spaces designed by MUMA have been configured to direct visitor’s sight-lines towards exterior views. Over 300 artfacts from the Abbey’s past will be displayed, including wax funeral effigies and original architectural drawings by Nicholas Hawksmoor who worked on the abbey during the 1700s. These have been arranged according to the results of a year-long light study that building service engineers Max Fordham carried out to ensure collection items were not damaged by the sun’s rays over time. Earlier this year Stockholm-based studio AIX Arkitekter erected a triangular exhibition hall to shelter the excavated ruins of a ninth-century church in southwest Sweden. Photography is by Alan Williams.